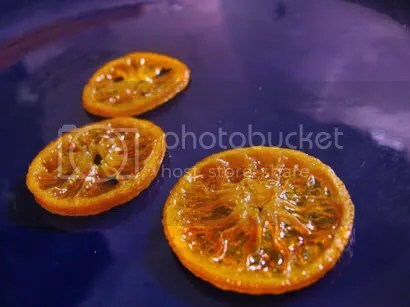 some small oranges, thinly sliced, about 3-4 mm. oven, pre heated to 80-100 degrees Celcius. Now for the simple syrup. 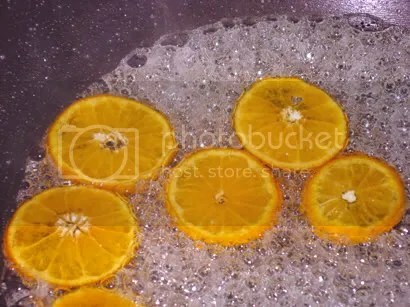 Boil 1 part of sugar and 1 part of water in a sauce pan (try 1/2 C sugar plus 1/2 C water, or more if you have a lot of oranges to bake). After the sugar has dissolved, reduce the heat and let it boil for another 1-2 minutes without stirring it. Then reduce the heat to low to make it simmer verrrry gently. Arrange the slices on the silpat/foil, and bake for about 1 H 30 M. The timing is just for guidance. Check the oranges at least every 20 minutes. Depends on your oven type, it is possible for the oranges to take lesser or slightly longer time to dry. Don’t let them burn. Start decorating your cakes, cheesecakes, cupcakes or whatever with this easy recipe gourmet-looking candied oranges!